Do you have a gravel driveway, road or parking lot that is being overrun by potholes and ruts? Are you looking for an economical and effective way to repair your driveway or parking lot? 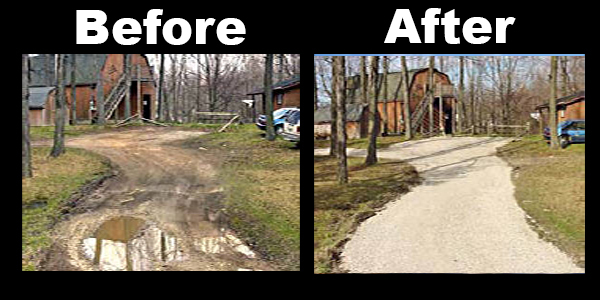 The Gravel Doctor™ system uniquely recycles, levels, grades, and restores your unpaved surface. Designed to be environmentally friendly, economical, fast and highly maneuverable. Potholes, ruts and corrugations are completely removed from gravel roads, driveways, commercial, industrial and municipal locations. A yearly maintenance service is available to commercial, industrial and municipal customers! Lasting pothole and rut repairs for gravel driveways and road surfaces require a thorough approach including scarification (not scraping), grading, proper elevation for crowning, high quality gravel products / aggregates, surface compaction and a complete drainage plan. Please see our process page for more detail. If you live in the Eastern Maine region, please contact the Gravel Doctor of Eastern Maine. Gravel Doctor services are available throughout the mid-coast region from the greater areas of Belfast, Camden, Waldoboro, Nobleboro, Damariscotta, Wiscasset, Bath, Brunswick, Freeport, Portland, Lewiston, Auburn, Augusta, and all points in between. For service in the Eastern Maine region, please contact the Gravel Doctor of Eastern Maine. Gravel roads, parking lots and driveways, economically smoothed, leveled and renewed.